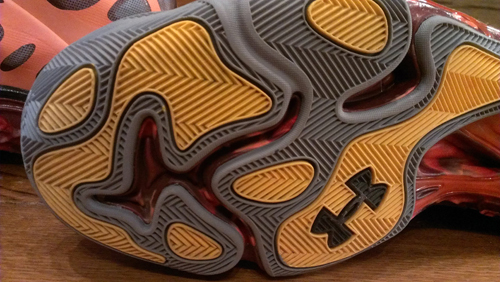 The Under Armour Micro G Anatomix Spawn is not built to blend in. Its name is loud, it begs to be stared at and when you put it on your foot, it stands out as one of the best all around shoes of the year. It’s not a new concept, but Under Armour bills the Spawn as a shoe that becomes part of your foot (Jason Petrie, the legendary Nike designer, said this about the Flightposite I way back when). There’s a certain organic quality to the shoe – I think you can tell it and the Flightposite were similarly inspired yet executed in an entirely different manner. I was initially intrigued by the shoe because I felt it looked like a shoe that someone had sketched out on a piece of paper, then was taken straight to production in that same raw, organic form. Creatively, I felt like I connected with the shoe and it only got better once I put it on. With Stephen Curry’s recent signing with Under Armour, look for him to raise the profile of the shoe on court this season as well. His Golden State colorway worn during the preseason may be one of the best yet. 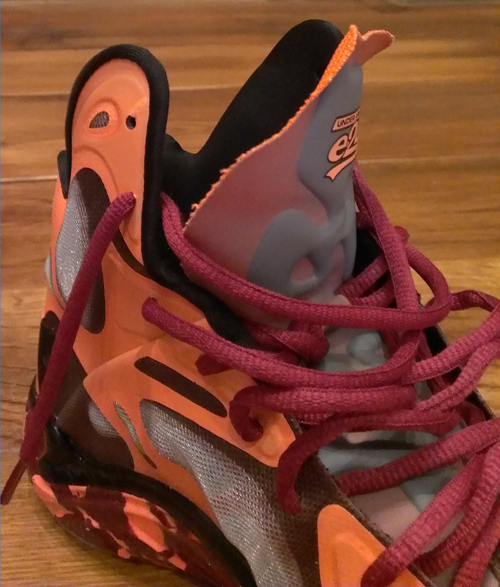 The first thing that stood out to me when researching the design and technology background of the shoe was that Under Armour says that the upper of the Anatomix Spawn supports the tendons and structure of the foot. This is primarily achieved through a fused, layered upper very similar to Nike’s Hyperfuse technology (though UA calls the process a “hot melt” and it’s “a way of layering synthetic.” There’s a base mesh layer (grey in this colorway), two different levels of overlays that get progressively thicker (the maroon portions around the edge of the mesh) and a final outer layer (orange) that is placed around the foot in varying degrees of thickness in areas where the most support is needed. Spawn designer Ross Klein provided some sketchwork in a SoleCollector interview that revealed some of the creative process behind designing those layers in a way that would support the muscles, bones and tendons of the foot. All in all, the process worked and I felt like the upper provided great fit. The heel counter is rock solid and when laced up the fit was snug from toe to collar – no weird flex points once it was broken in. Personally, I don’t necessarily love having a shoe laced up so snug and so high on my ankle, but the fit was great in terms of lockdown and security. It was slightly stiff on the first few wearings and at 10.7 ounces it’s not heavily padded on the interior and can feel a little harsh. The tongue had targeted padding, but was pretty skimpy as far as comfort goes. 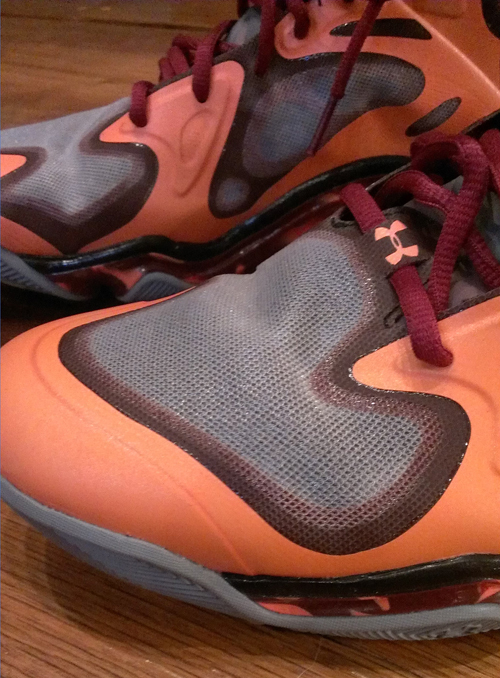 But the lockdown, especially in the heel and through the midfoot (it runs narrow), is excellent. The midsole is highly sculpted and is designed to mimic and fit the foot tightly, and it definitely does. There’s a sizeable gap from forefoot to heel which can lead to a slappy transition, but the outsole and midsole are cored out at various points throughout the shoe. This makes it flexible at exactly the right spots and makes the transition pretty effortless. It’s especially cored right around the big toe area on the outsole, making that area independently flexible and allowing the wearer to really plant and push off of the toe. It’s a nice touch and an anatomically beneficial design aspect. Micro G is one of, if not the best foam cushioning platform on the market in my opinion, and the Anatomix Spawn features the technology from heel to toe. Micro G is more responsive than most foam systems and, to me, has a longer shelf life than others such as Lunarlon. The shoe also plays low to the ground and the court feel is excellent – again Micro G with its responsiveness allows for a low-profile midsole yet still provides impact protection. It does sit slightly higher in the heel than the shoes I’d been playing in (adidas Crazyquick, Crazy Light 3) but I think that sensation was just due to the fact that those two models play extremely low to the ground. 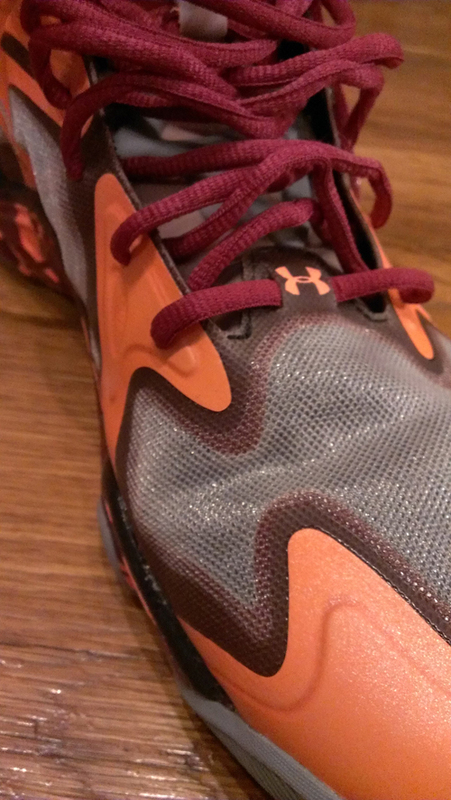 Perhaps my favorite aspect of the shoe though, was the TPU support frame. The solid TPU piece runs along the lateral side of the shoe (providing lateral support) and wraps underneath the foot where it’s cut out in certain areas to provide firm support without extra weight. 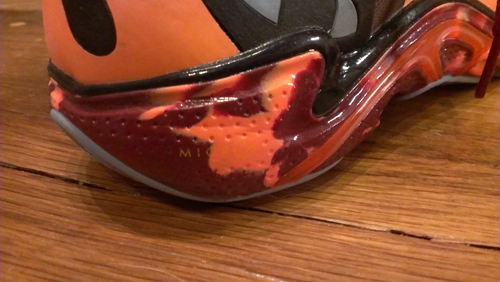 The orange frame runs from near the ball of the foot all the way through the midfoot to the middle of the heel. This is one of the biggest midfoot frames I’ve ever seen and it provides some of the best torsional support I’ve had in a basketball shoe. It was both engineered and executed very well. 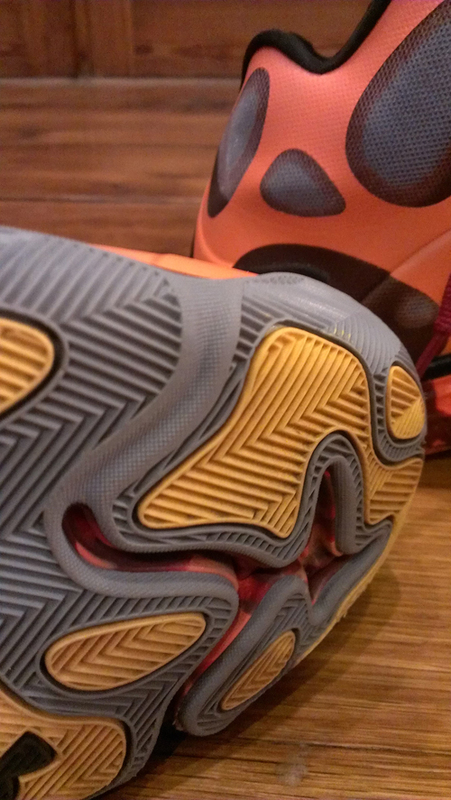 The Anatomix Spawn uses full length herringbone on each of the pods of the outsole, and it provides tried and true traction. The rubber compound used is firm and the herringbone pattern is tightly placed. If we’re nitpicking, sometimes I like to see a wider-grooved pattern in the herringbone but it’s nothing major. No complaints from me in the traction department. The upper is a full synthetic hot melt, so I don’t foresee any issues with the materials separating or coming apart, but the upper isn’t the most luxurious thing you’ve ever worn. It’s not bad, but like all fused materials it never truly flexes naturally. The toe flex is fine as it’s mesh all the way across the toebox, but the repeated creasing of the mesh creates a point on the inner part of the toebox where I wouldn’t be surprised to see a tear develop eventually. Other than that, the outsole traction has held up well on various floors, cushioning has remained responsive and the upper seems to be holding up well to this point. 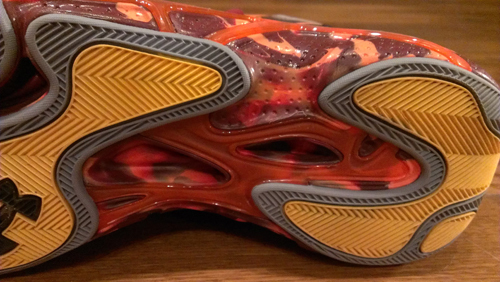 The Anatomix Spawn is a shoe that I frankly loved playing in. 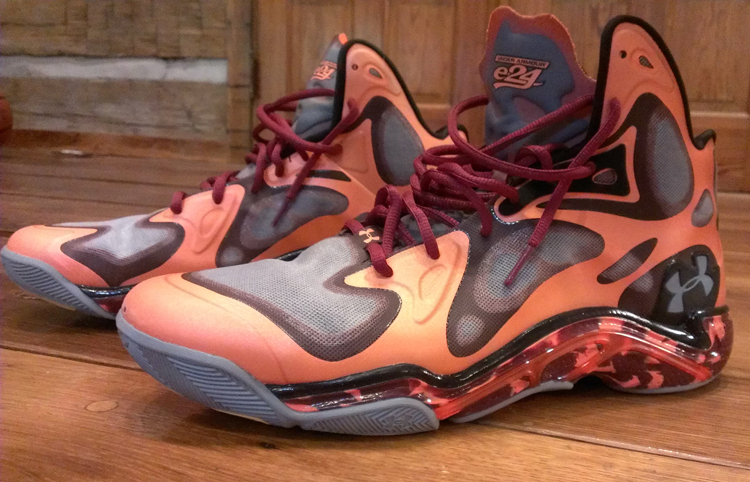 The fit was excellent and the support, thanks to that TPU frame, was the best I’ve found in a shoe this year. I can’t stress how nice it is to play in a shoe that’s both light and still supportive through the midsole, and the Spawn strikes a great balance. Traction and cushioning were both very good if not great. With pictures of a low top model, this may not be the last Spawn that I purchase this year.